Why are trampolines a better gift than gadgets? Kids have seemingly endless energy sources that keep them fueled to run, JUMP, and play around. Their want to move is due to the fact that they learn best through playing, engaging their senses, and letting their minds explore and discover things. Active play – and one good example is trampolining – allow them to do the above-mentioned things and more. 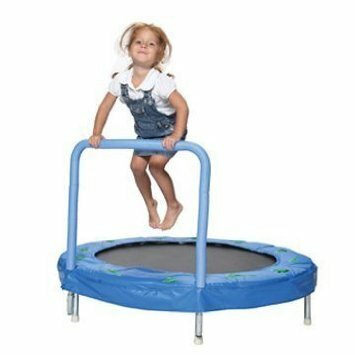 Top 18 Trampolines For Home Use – Indoors And Out! Nevertheless, no matter how fun trampolines are, there are associated risks to having one at home. These risks include minor and major injuries — from cuts to bruises to concussions and broken bones. Price – provided the possible risks attached to trampolines, don’t scrimp when buying one for your home. However, there are also trampolines that are pricey yet low quality. So, be aware of those. Reviews – we considered the opinions and experiences of the real-time users of the trampolines we featured in the list below. Warranty – what does the product’s warranty cover? But before we move on to the list, you have to get to know the different trampoline types. This way, you’ll be able to gauge your preferences when buying one for you and your kids. Round Trampolines – the most common type, the round ones are also referred to as recreational trampolines and are ideal for home and outdoor use. Rectangular Trampolines – they are usually made for semi-professionals and professional gymnasts as the shape allow for greater heights and rebounds. 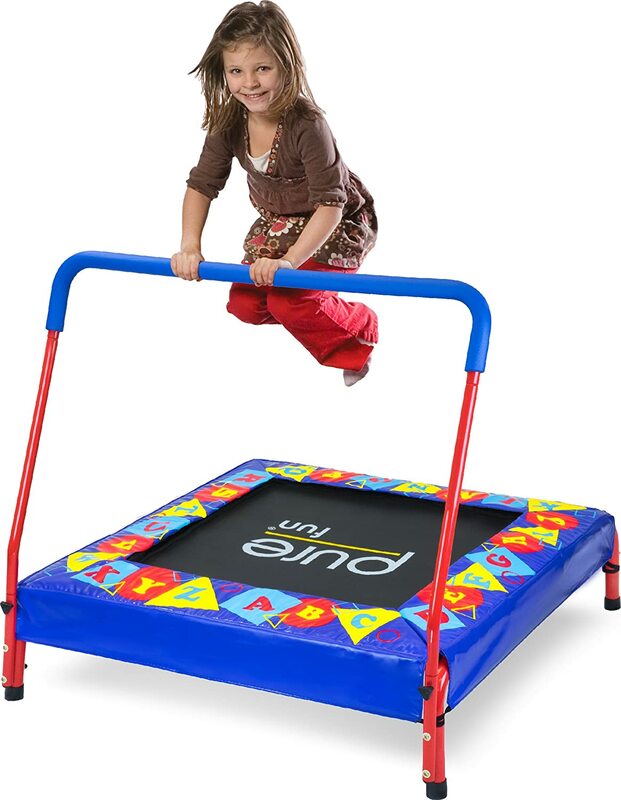 Square Trampolines – accordingly, square tramps give the best of both round and rectangular ones. But they can be expensive as well. 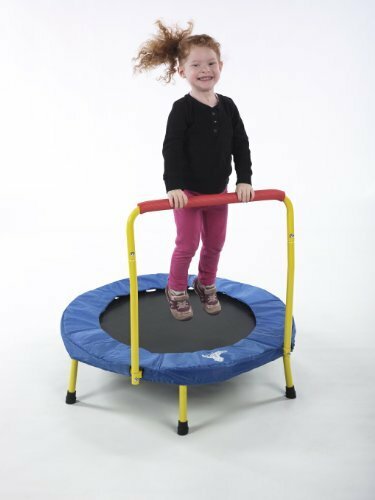 Mini Trampolines – known as rebounders, they’re the ideal ones to use indoors or for those who don’t have much outside space. Springless Trampolines – dubbed the safest among trampoline varieties, they’re so named because they don’t use metallic springs to give them bounce. With this information out of the way, let’s move on to our list of top 18 trampolines based on the considerations we mentioned above. A trampoline ideal for kids aged 3 years old and up. Some buyers complained about the quality of the bands’ cover and the looseness of the handlebar screws. Manufacturers claim the product is easy to set (around five minutes). All you have to do is unfold, screw on legs, attach handlebars, and bounce away. 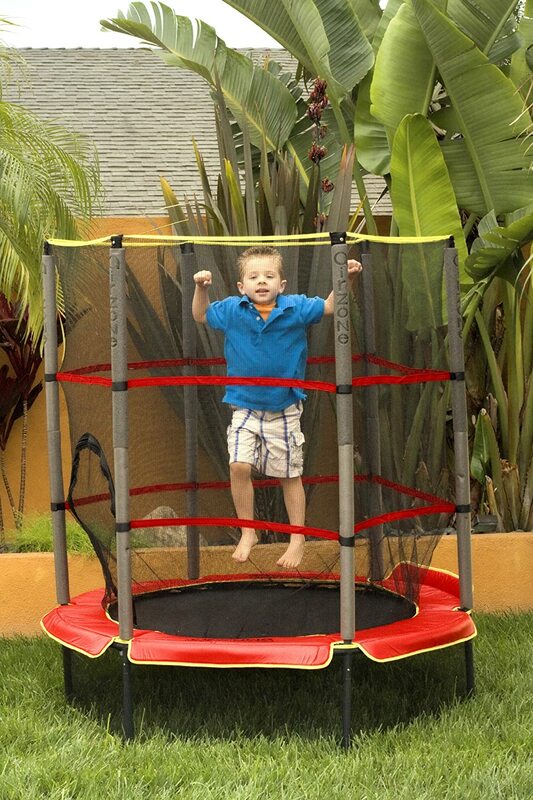 This 36-inch trampoline can handle up to 150 pounds/68 kilograms maximum. It’s fitted with six legs instead of just the standard four for more stability. It meets the standards of the ASTM (American Society for Testing and Materials). It’s currently on sale — from $100 down to $88. Jumping pad needs to be adjusted frequently. 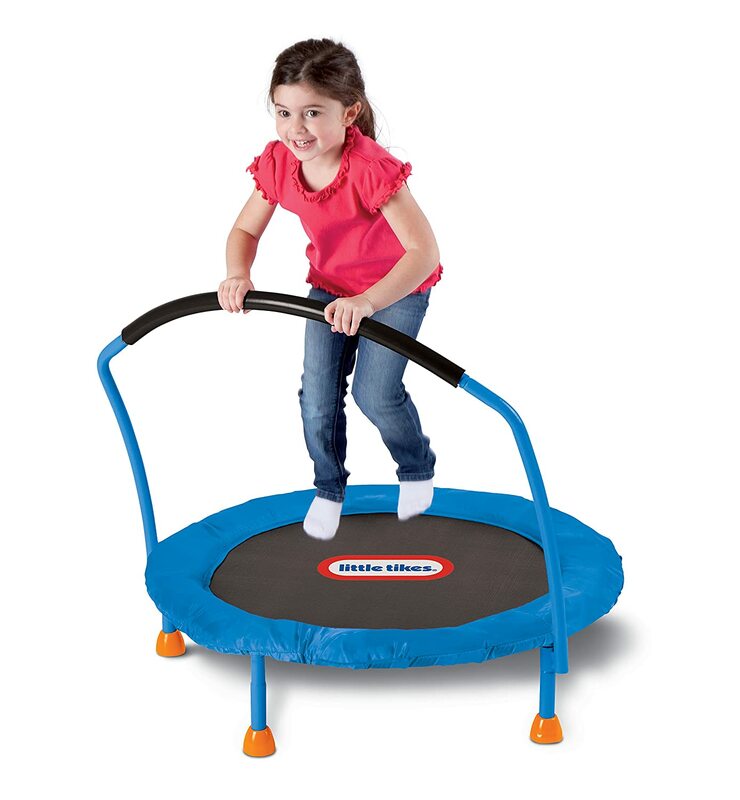 This trampoline is good for kids aged 3-6 years old (a 2-year-old can jump on it but a 1-year-old wouldn’t be able to reach the handlebar); the ideal first bouncing pad for your toddler. Materials used for the product are a combination of plastic and metal. Has a jumping surface of about 36 inches. For indoor use only; great for the rainy days when your little ones need to vent off their energies. The protective foam on the handlebar disintegrates easily. Maximum weight limit is just up to 55 pounds/24 kilograms. 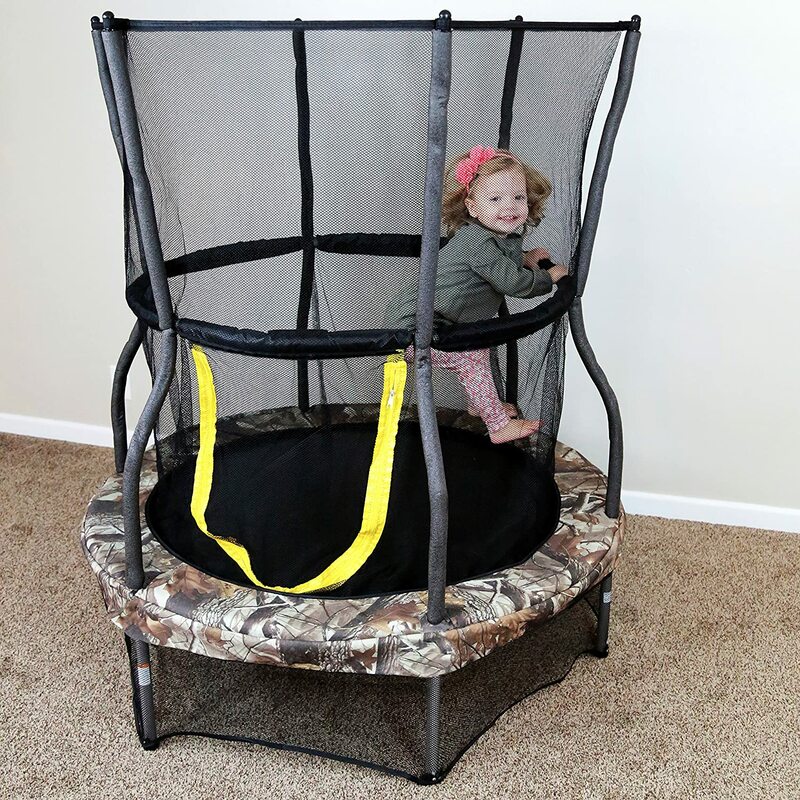 Manufacturers greatly recommend this trampoline as a first for your kids. The overall blue color with frogs print on the protective side sheet will surely be a hit to little ones. It’s wider at 48 inches and features a padded handlebar for comfort and safety. Its handle’s height is also adjustable. Its frame is made of galvanized steel with 6 legs for durability and stability. It comes with warranties – 1 year for the frame and the jumping surface, 6 months for the frame pad and 90 days for all the other parts. Weight limit is 100 pounds/45 kilograms. 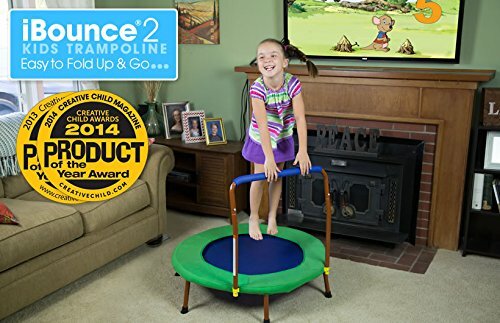 This trampoline doesn’t only let kids spend their energies by bouncing, it also teaches them, too. The triangular shape of the trampoline, its bright bumper pads, and the bike-like handrail will surely pique any kid’s interest. Fitted with a five-in-one multi-game sound system for fun ways of learning. Recommended for kids aged 3 to 7 years old. Ideal to use both indoors and out. 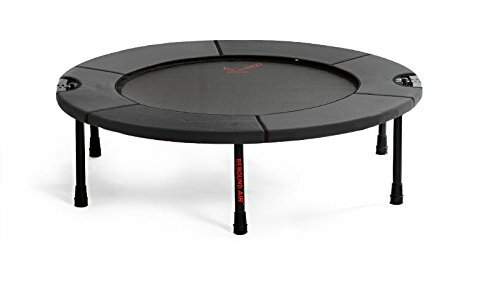 Its design gives off the impression that it’s not as steady as the other more common trampoline types. Some buyers complain about it being difficult to set up. 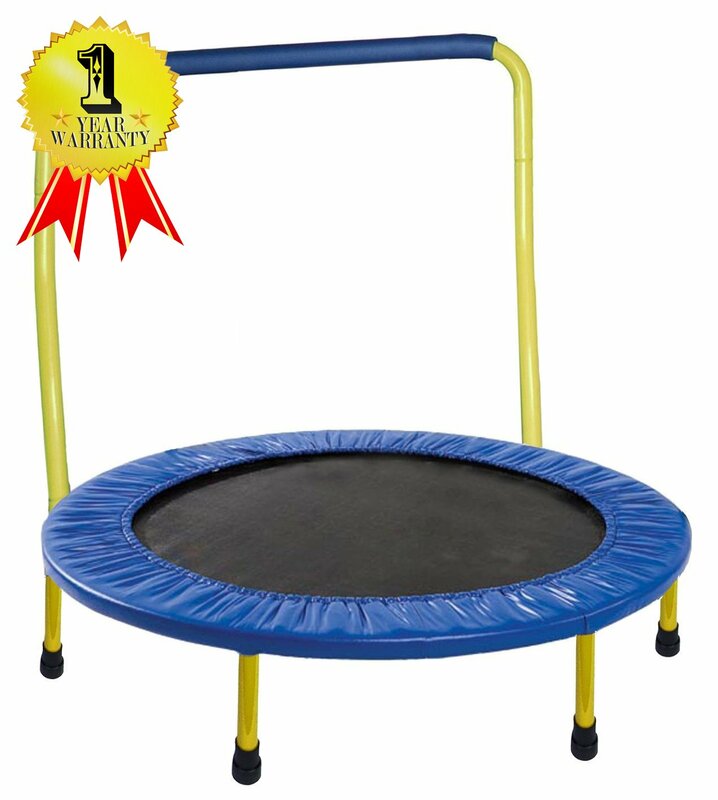 This rectangular trampoline is recommended for kids between the ages of 3 and 7 (weight capacity is 75 pounds/34 kilograms). Its bouncing system is ASTM, TUV/GS and CE certified. Its springs are covered with a protective mesh and covering printed with fun ABC prints, something that kids will love and surely learn from. Handrail is also padded for safety and balance. Product has a 90-day warranty. Some buyers complained about how difficult the trampoline is to assemble. 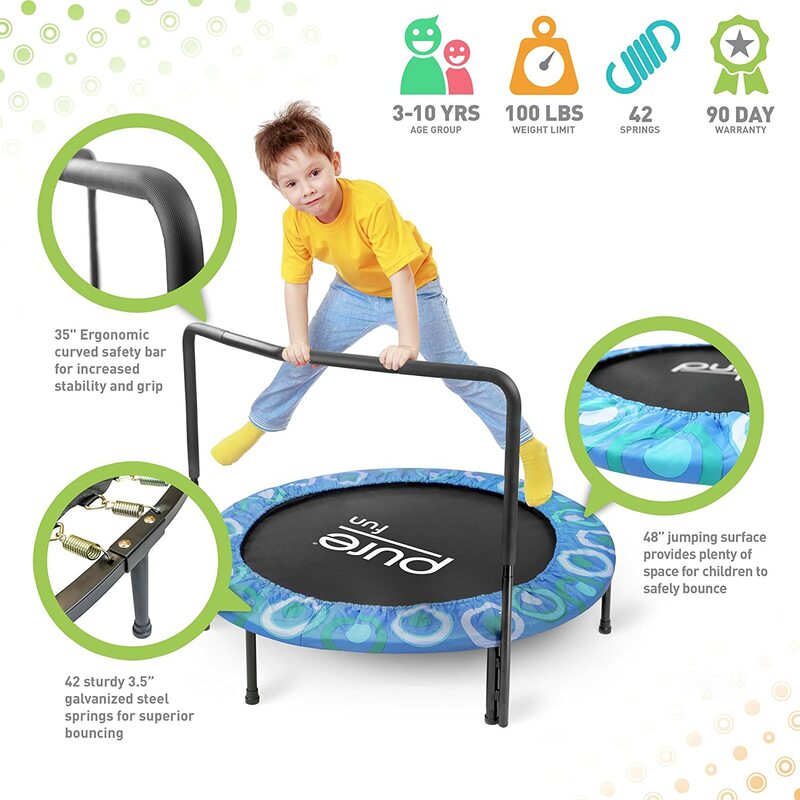 Another trampoline from Pure Fun, this one’s round with a wider jumping surface of 48 inches. Comes in two colors — the springs’ protective covering is either in pink or blue (depending on your choice) with fun retro prints. Recommended for kids aged 3 up to 10 years old (weight capacity is 100 pounds/45 kilograms). The handrail provides safety and stability as your kid uses the trampoline. Has ASTM, TUV/GS, and CE safety certifications. Hard to put up because of confusing directions. Designed for kids, older kids and even adults. 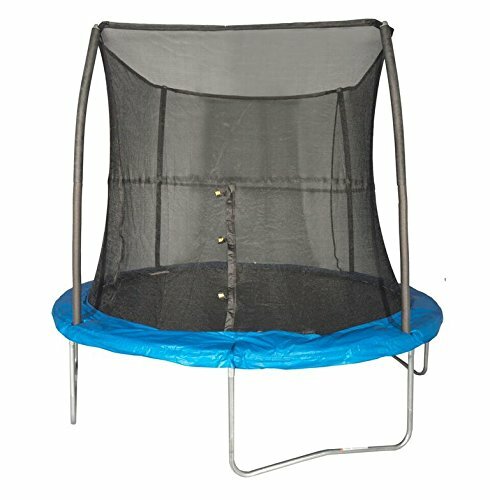 Described by manufacturers as the “Cadillac of rebounders” — the materials used for the trampoline are durable and can take on high impacts. All parts are warrantied for a lifetime. Makes significant noise especially if kids use it. 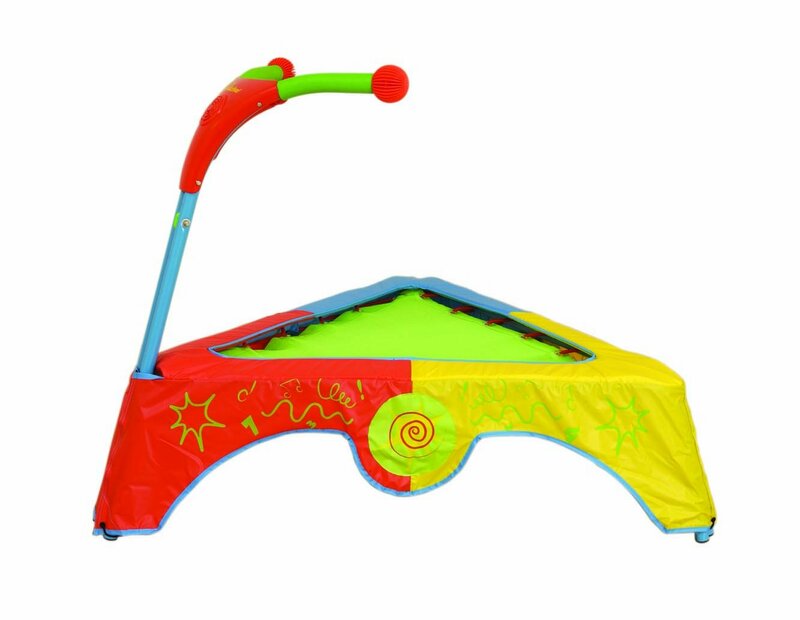 This trampoline is ideal for kids aged 3-6 years old (weight capacity limit is 100 pounds/45 kilograms). It doesn’t employ springs but uses long-lasting bungee cords. It comes with an interactive DVD series featuring the own brand’s fun-loving character, RompyRoo. Your child can play, bounce and learn along with the series (DVD is iPad-friendly). 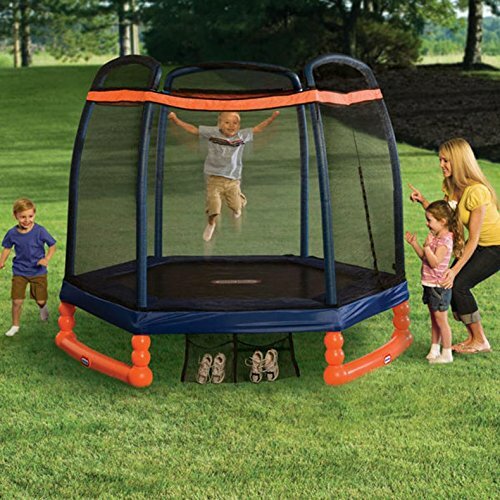 This trampoline comes with a protective net that keeps little jumpers from falling off, thus, preventing injuries. The steel frame is sturdy. Fitted with an all-around padded handle your little ones can hold on to as they jump for more stability. 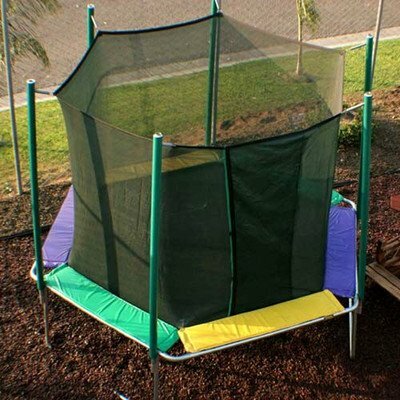 It also has an enclosure net for its lower parts so kids won’t be able to crawl underneath the trampoline. It’s spring-less and ASTM approved. Has a 100-pound/45-kilogram weight capacity — recommended for kids as young as 3. The net gets torn easily especially if kids engage in rough-and-tumble plays. The product’s made of steel so it’s sturdy. It’s fitted with a patented enclosure net (manufacturers claim it’s the only with patented nets) for safety with a zippered door for convenience. It’s spring-less; uses a soft bungee cord suspension system for its bounce, so kids are safe. Recommended for kids aged 3 and above who are within the 60-pound/27-kilogram weight limit. ASTM certified with one year warranty. The protective net’s poles bend when jumper lands on the net. 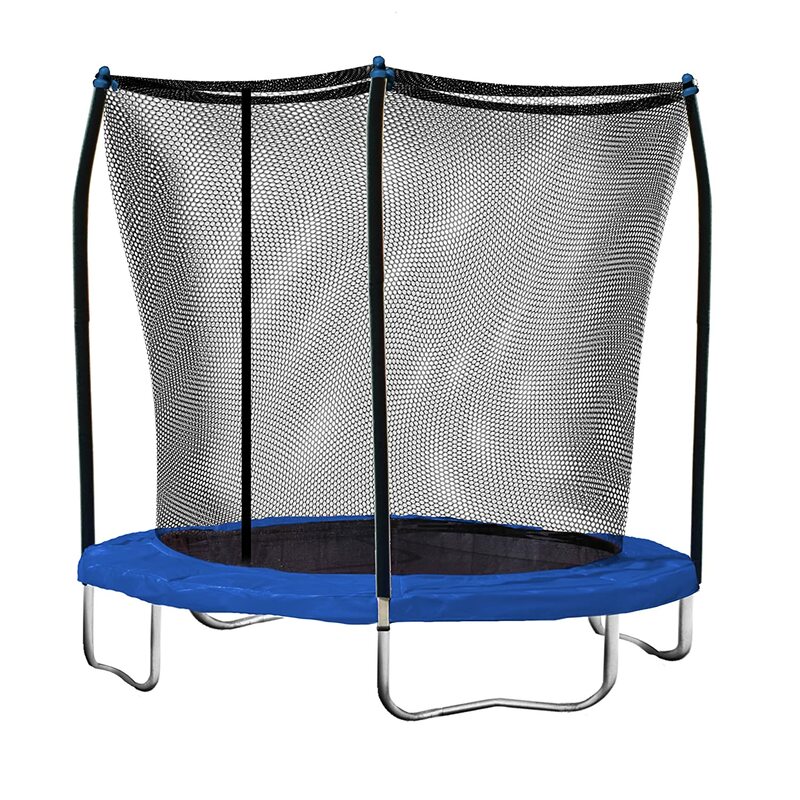 This 8-foot trampoline comes in two colors – blue and green. It’s fitted with a safety enclosure net attached to poles that are connected to its frame to prevent frame twisting. Furthermore, the safety net is directly connected to the jumping mat. This feature keeps jumpers safer, preventing them from injuries caused by falling in gaps. Great for outdoor use for kids aged 6 and above (maximum weight capacity is 175 pounds/79 kilograms). The poles holding the net up don’t have protective padding. This hexagonal trampoline is made for the outdoors. Jumping surface is made from permatron fabric, a material known for its durability and strength. This trampoline has the maximum weight capacity of up to 450 pounds/204 kilograms, the highest in the trampoline industry. It comes with a 10-year warranty (frame) and a 5-year warranty (mat/cage). Ideal for kids aged 4 and up (even for adults given its weight limit!). 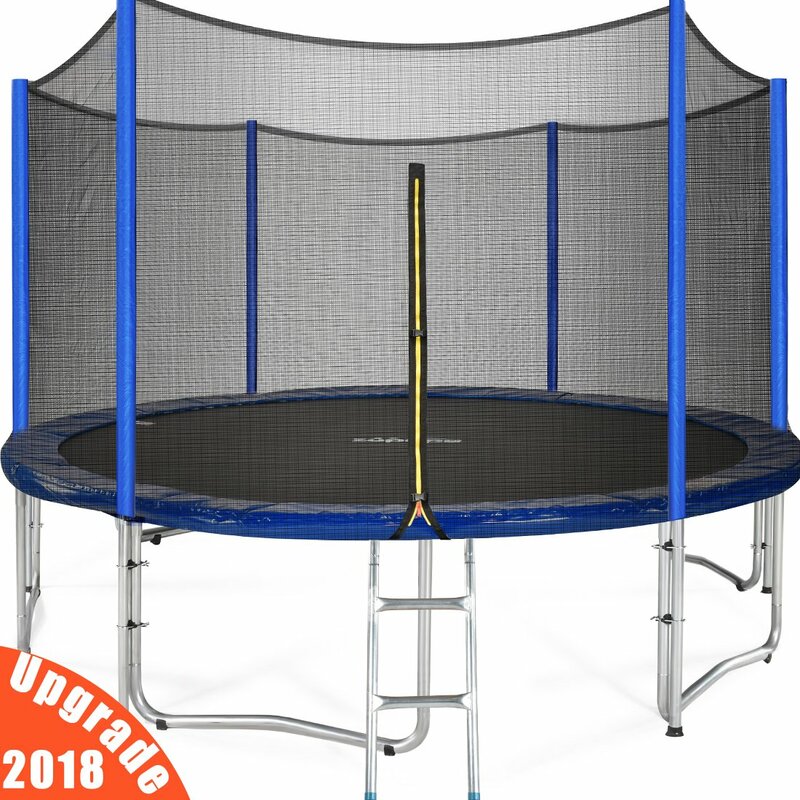 Trampoline is goof for both indoors and outdoors use. Ideal for kids aged 3-10 (weight limit is at 105 pounds/47 kilograms). Its mat-and-pad design is in one piece to ensure kids’ safety when using the product. The steel frame is galvanized making it sturdy and durable. But its plastic-molded so the legs won’t scar wood flooring. Product meets US ASTM safety requirements. 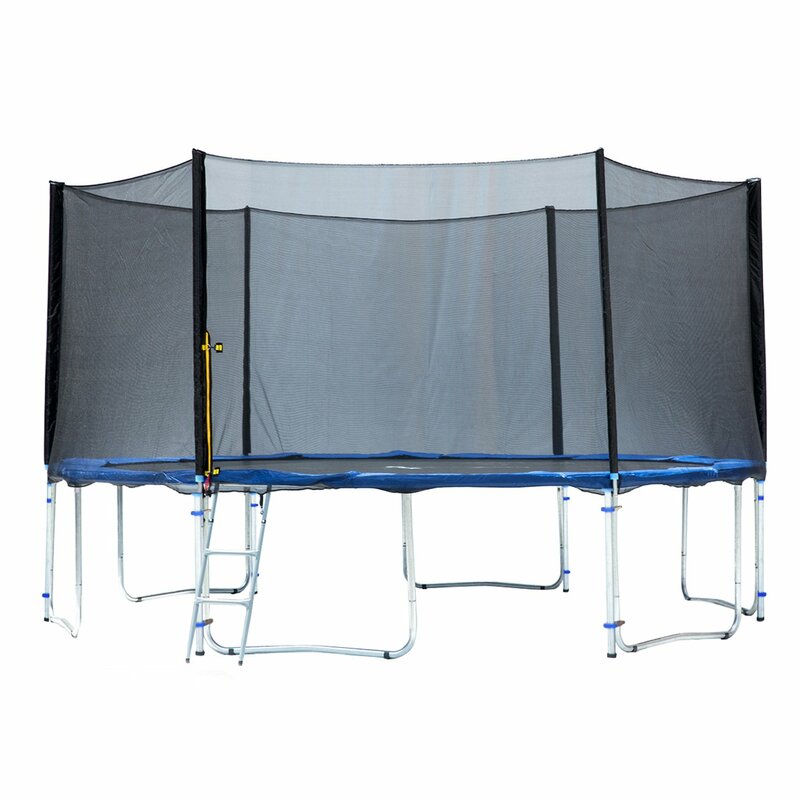 A safety net is fitted with zipper for convenience going in and out of the trampoline. Has a 2-year warranty (limited parts). This trampoline’s frame is made of galvanized steel which can withstand heavy use and rust. It has 6 W-shaped legs with 12 contact points making it sturdier than the more common ones with 4W or 5W legs. Fitted with durable wraps and ropes to tie the net to the trampoline more securely. The net’s fitted with a zipper for ease going in and out of the jumping surface. It comes with a galvanized steel ladder. The product meets TUV and GST standards. For outdoors use; best for kids who are 6 and up, even adults (weight limit is up to 398 pounds/180 kilograms). Some customers suggest that the trampoline’s netting poles need to have stronger reinforcements. Trampoline is best for outdoors use. The frame is a combination of durable blow-molded plastic and steel. 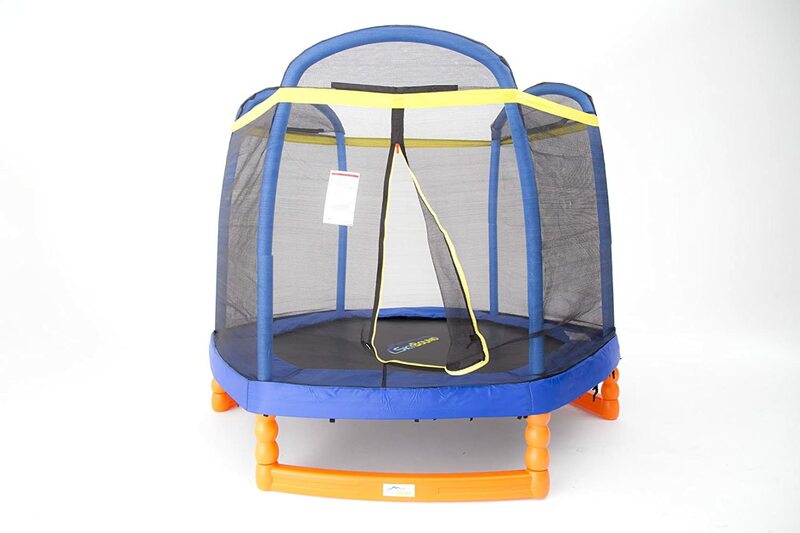 The net is attached to sturdy steel frames ensuring your kid’s safety as he plays. It has a shoe holder attached for convenience. Good for active kids who are between 3 to 10 years old (weight capacity is up to 100 pounds/45 kilograms). 48 pieces of galvanized springs power this trampoline’s bounce. But jumpers’ safety are ensured with the jumping surface’s protective covering. Its frame is made out of galvanized steel, durable and rust-resistant. The trampoline’s legs are shaped like a W for more reinforcement and stability. Additionally, its safety net is fitted with a zipper for convenience. There were no age recommendations for the trampoline. Manufacturers didn’t also note its weight capacity. Comes in three different sizes — 12 feet, 14 feet and 15 feet. It comes with a TUV certification, meaning, your kids’ safety is assured when using this product. The trampoline’s frame and poles went through a hot-dip galvanizing process ensuring their durability and stability. This tramp is made to last for years. Additionally, the material used for its pad, mat, and net have a UV absorber added to them to make them last long even when left off under the heat of the sun. Inclusions include wind stakes, an added notch to the product’s stability; gloves you can use when assembling and installing the trampoline and a rain cover to protect the trampoline during rainy days as well as from the dust. Hailed as a “well-made trampoline” by buyers. Customers complained about its manufacturers have zero customer service and slow in keeping up with their issues.